Bell, Canada’s largest communications company, has released version 4.5.1 of their market leading Mobile TV App, incorporating new features provided by Vennetics, an innovator in telecommunications and IT applications. 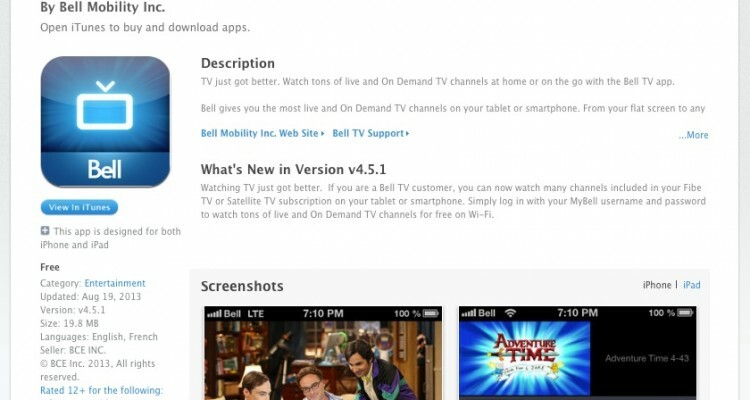 The Bell Mobile TV App provides an extensive set of Live and On Demand TV channels on both tablets and smartphones. From the flat screen to any screen, the App allows users to watch their favourite shows, latest news broadcasts and sport events, anytime, anywhere. Version 4.5.1 of the Bell Mobile TV App has now been released, adding new features for enhanced catalogue search and auto-authentication of users across multiple networks and devices. The solution provides for full DRM rules enforcement against Live and On Demand content, depending on the device and network connection being used to access the service. The App is available for iOS, Android and BB10 platforms.